W. Bro. Dinesh B. Panicker was born in Trivandrum on 16th July 1966 as the only son of Shri.T.K. Bhaskara Panicker and late Smt. D. Rema Devi Pillai Thankachy. Dinesh after finishing his formal schooling from Trivandrum went on to the College of Engineering, Trivandrum. Dinesh is one of the founders of "Medient" - a global entertainment company. At "Medient" he oversees the entire spectrum of the back end operations including vendor management and process control. Prior to medient, he ran an extremely successful advertising and Public relations company called "Renfrew" and to his credit is "Prasthan" the first event management company in Kerala started way back in 1992. As an individual, his interests include sports (swimming, rifle shooting & shuttle badminton), reading, music, movies, travel, art, theatre and other refined cultural activities. He has a wide circle of sincere and gifted friends from all age groups. A man of no major vices, he is a perfectionist with an outstanding sense of aesthetics, fully dedicated and committed to whatever he undertakes. Masonic Bio-data: Saw the light of Freemasonry on 20-02-1999 in Lodge Trivandrum No 168. Took up the post of Treasurer of the Lodge in 2001 and rose to a JW of the Lodge in 2010. A dedicated mason with the distinction of having missed only 1 Lodge meeting in the last 8 years (118/119)! W. Bro. 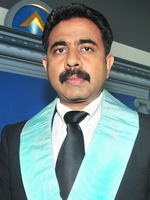 Dinesh is also a founding member of Lodge Travancore No 329 and other side Degrees.